Granville Island in Vancouver - An island with its' own personal charm! Land ho! 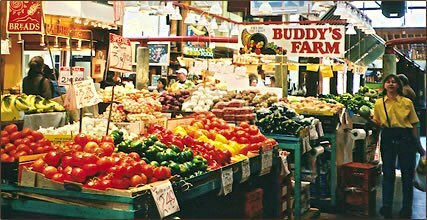 Check out Granville Island when you are visiting Vancouver! You won't be able to resist its' personal charm and energy. From theatres to markets, to top bars and restaurants, there is something for everyone. The island is located on the picturesque waterfront of False Creek and its' gritty, industrial past has completely changed into an artistic and magnetic destination for Vancouverites and visitors. The island is currently attracting more than 10-million people a year and believe us! they are not coming to see the cement trucks that still discreetly rumble through the entry gate of the only remaining cement factory in the city core. The island as a destination not only works, it thrives with energy! Since its redevelopment in the 1970's, Granville island has maintained a healthy community of craft studios, including a glassblowing studio, a printmaking shop, a master shoemaker, various jewelers, a luthier and the B.C. Potter's Guild. A weekly public farmer's market has also been ongoing since the island's redevelopment. Check out the Public Farmer's Market here! This thriving island is a small peninsula and shopping district in Vancouver, British Columbia, Canada. Granville island was once an industrial manufacturing area, but it is now a massive tourist destination that provides something for everyone! Granville Island Brewery! Since 1984 British Columbia Beer Drinkers have experienced the finest handcrafted beers from Canada's first microbrewery. Take a trip through memory lane by clicking on the previous link or on the photo below! Visitors and locals alike can enjoy a weekly public market, a large marina, the Emily Carr Institute of Art and Design (named in honour of the artist), bars and restaurants, theatres, and various shopping areas clustered around the one and only industrial outpost remaining, a cement plant. The island is very popular with tourists and locals alike. Check out this map below for a clear idea of where you will be discovering! If your looking for the most convenient place to stay on Granville Island, check out the Granville Island Hotel that lies in the heart of the action, but not overwhelmed by it either. The hotel is easy to get to, but hard to leave because of the fantastic service and atmosphere, not to mention the views you will endure! 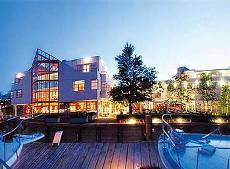 The Granville Island Hotel is ideally located for families, business travelers, even locals wanting to try out somewhere new for the weekend, as well as couples on a romantic getaway. Contact the Hotel at Tel: 1-800-663-1840 (toll free in USA & Canada)and locally call: 604-683-7373. Check out one of Vancouver's most popular restaurants on Granville Island! Bridges opened its doors in 1980 and has been one of Vancouver’s most popular destination spots and patios ever since. Catering to both locals and tourists, Bridges offers a variety of eating experiences: Bar, Dining Room, Bistro, and outdoor dining on our Deck . Bridges’ Deck is the largest outdoor open seating deck in Vancouver, seating up to 300 people at any given time. It is open 7 days a week and you can call for more reservations and information at: 604.687.4400. ENJOY YOUR MEAL ON THE ISLAND!